The project called Electronic Church is an electroacoustic spatial light installation, in which the author explores the architectural relations between the physics of light and the sound acoustic undulation of reflection in space. The theoretical experience is drawn from the tradition of lumino kinetic explorations of op-art and minimalism. 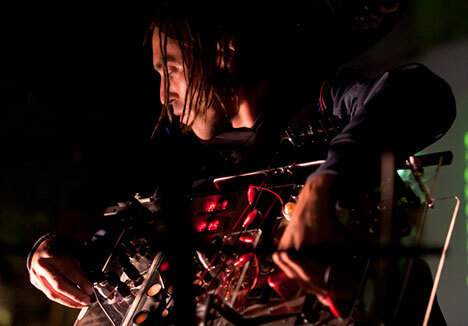 Marko Batista graduated in painting at the Ljubljana Academy of Fine Arts, and got a Master’s degree from the University of the Arts London, Central Saint Martins in London; he works as intermedia artist, experimenter in sound and digital video image, and performer of computer-generated matrices. He is co-founder of the multi-media group KLON:ART:RESISTANCE. With his AV performances and video works he has appeared at more than forty festivals and group exhibitions, such as the 10th Biennial of Young Artists from Europe and the Mediterranean in Sarajevo, the “95-05” exhibition at the Museum of Modern Art in Ljubljana, the Centre for Contemporary Arts in Glasgow; the Izolenta 07 festival in St Petersburg, the 10th Istanbul Biennial in Turkey, the Media Art Friesland Festival 2007 in the Netherlands, the Visual Deflection festival in London, the BIX-Façade Kunsthaus in Graz, Austria, the Arzenal Depo 2k in Ljubljana, the Earzoom, the Pixxelpoint in Nova Gorica, the festival of computer arts in Maribor, the Peek&Poke in Croatia, the SHARE FESTIVAL in Turin, Italy, and LAB.30 in Germany. He had a solo exhibition at the London Empire Gallery, he appeared at the Ars Electronica festival in 2008, and his exhibition opened the VIENNABIENNALE 2008 in Vienna. He has performed at the Museum of Contemporary Art Metelkova, at the Škuc, Kapelica, Simulaker and Kapsula galleries, the Old Power Station, etc. Srdjan Deba Ivanović is an artist from the Western Balkans, who works in and explores the fields of drawing, painting, graphic arts, design and contemporary media. He graduated from the Academy of Fine Arts (Graphic Arts) in Trebinje, Bosnia and Herzegovina, under the supervision of Professor Mirko Toljić. He has exhibited his work in solo exhibitions as well as within the framework of joint exhibitions and festivals. This is the first time he appears in Slovenia, at the Lighting Guerrilla (Svetlobna gverila) festival, with the joint project Electronic Church with Marko Batista.